Because the seventh floor is the gateway to Hogwarts' biggest towers, you can expect to access quite a bit of the castle from here. The most notable areas that this corridor provides passage to are the Owlery, Astronomy Tower, Divination Tower, the common rooms for both Gryffindor and Ravenclaw, and, if you know where to look, the Room of Requirement. Sweeping views of the Quad below are available thanks to a series of large windows. After stepping onto the seventh-floor corridor, a statue of Lachlan the Lanky immediately greets you. There really isn't anything overly special about him, but one can hide behind him and not be easily found if you're playing hide-and-go-seek or are just wanting to completely avoid someone. A renowned tapestry and numerous portraits, ranging from a mother and her baby, various wildlife animals, and the chivalrous Sir Cadogan adorn the walls. The latter portrait, should you ever need help getting around, is always eager to assist those who are, allegedly, in distress. Getting up early wasn’t exactly Caolan’s strongest attribute. In fact, most mornings it had taken his Ma a lot of effort to get him out of bed, ready and out the door onto the bus in time for his old school. He was a teenage boy who deserved as much sleep as he could get, at least that was what he kept telling himself. But for some reason this morning he was up and out exploring the castle at what could be described as a reasonable hour. It was mostly so he could avoid the crowds of students and challenge himself to find his way around. He didn’t fancy joining the tours of first years all eager and bright eyed and bushy tailed, nor did he feel comfortable quite yet tagging along with some of his year mates. He had familiarised himself with a couple of names but not so much as to call them friends quite yet. They were more like acquaintances. He hoped that would change eventually. He walked along a corridor and took a left turn expecting to have ended up outside the Ravenclaw common room only to have found himself along another corridor which looked exactly the same as every other corridor in this school. Guess it would make sense for him to have got lost in the first term considering how bad he was at Geography at his old school. Navigational skills not on point. Ronan was exploring. Which meant, for him, that he had a funny hat on - it was really cold up here, way colder than in Cornwall, so really it served two purposes - and his notebook from home. It was a special notebook that was supposed to be only for Hogwarts related things, like funny stories and interesting things he happened upon, some phrases he overheard said by anyone (especially the paintings), and more things like that. So far, all he had in it was a Hufflepuff sticker and some illegible things he'd jotted down half asleep last night. Today it was his mission to add some more stuff. Portraits seemed like the easiest way to get, uh, stuff. So. Ronan watched the portraits, meandering around the castle without a thought as to where he is going, and consequently did not notice someone else there until it was too late and he walked backwards into their middle. UH. "Oops! Sorry mister!" Oh, it was a student. ".. Sorry!" He was sure that a left turn would take him back to his Common Room and yet here he was staring at a blank wall trying to retrace his steps in his head. How was it possible for someone with such a logical brain and of reasonable intelligence to get lost in a castle so quickly into the term? His thoughts were disturbed however by a sudden bump to his waist and he was knocked unexpectedly off balance. He frowned for a second as he steadied himself but that frown quickly faded away when he saw what it was that had walked into him. It was just a small kid and quite frankly you couldn’t remain angry with a first year for very long. “S’alright kid” he chuckled. “What are you doing there?” he asked glancing down at the notebook in his hand. He wasn’t studying already surely? It was only a few days into term! It was very normal for Lady Helena to wander the upper floor corridors in particular. It was no different at the said time. Her mood today? Happy and content. All was right in the Castle with the exception of the furries seen at the Feast. Still all was calm so they could not have been harmless. Lady Helena was trying to decide where to best pass some of her time when she heard an exchange of words. A few drifts closer to the voices it was discovered that Caolan and a younger student were there. With her next class more than an hour away, Kassie decided to take a walk around the corridors. Working in the divination classroom, all warm and cozy from the fire, had made her a bit sleepy. Not the state she wanted to be in when a room full of curious students sat before her. The late fall November chill had penetrated the castle, making it necessary for her to wear her more hardy robes. The day's selection was a rather loud shade of lime green with indigo trim, one of her favorites. She loved the way the bright color played off her chestnut hair. The green also resembled balance and harmony, along with being connected to the heart chakra. It was the perfect choice for the day. Thankful to be high on the wall, well out of reach of the pink creature horde, the seventh-floor corridor portrait inhabitants let out various squeals, gasps, and fearful phrases as they watched a pink fluffy run past. Word of what happened to the Slytherin and Hufflepuff tables as well as the consumed professor had traveled their way and they didn’t wish to be the next victims. Scampering down the halls in an attempt to hide from the humans with the cages, the Mutants paused for only a few minutes at a time. With The Horde splitting off and heading out all over the castle and grounds, they knew they had to find hiding spots lest they find themselves caged. They hurried down the corridor, hearing the voices from the Portraits, and hoping the cage bearers wouldn’t hear the commotion. The seventh-floor corridor seemed to be a good place to start their search. It was the jumping off point for the towers and, if they could keep one or two from their team at the end of the corridor, they could prevent any of the Mutants from getting back to the rest of the castle. As she walked down the corridor the Portraits caught her attention. “It appears there are some up here. Let’s not leave any nooks or crannies unchecked.” Kassie bent down to look behind the bench, hoping to find a mutant, but there was none to be found. She stood back up and slowly continued down the corridor and towards the Divination Tower. "Let's split up if we need to, but do try to stay in groups of two at a minimum." Bear had sort of been swept along with a random group, opting to go where he seemed to be needed most rather than making a real conscious decision about it. That was how he found himself on the seventh floor -- his old stomping grounds, actually. He knew this corridor well. The former Gryffindor was amazed at how much things both changed and stayed the same. But no time to look around and reminisce now. He was meant to be searching for those cute little mutants. He probably wasn't supposed to think they were cute if he was holding a cage to trap them, but whatever. They were. He was truthfully a little miffed at being there, though of course he didn't show it especially since his boss was like RIGHT THERE and he wasn't an idiot. His job title was Charm Developer. Did this look like developing charms? No sir, it did not. It looked a whole lot more like crawling around on the floor, which is what he was doing at the moment. Very civilized and dignified, it was. He ducked his head under another bench across the way from where the professor (whose name he had forgotten to get and now it felt too late to ask) had looked. Nothing. "Anyone seeing anything yet? Any clues about where they might have gone?" Stupid question, probably, since anyone who did find anything would have already announced it, he was sure. "They like affection. So hiding the cage might be a good idea until the last minute. Please, make sure you have gloves on." Tristan said as he entered the corridor, just catching Kassie's instructions. He had thought he saw something and had stopped to check but whatever he had seen was gone before he could even try to befriend it....could have been a pet rat or toad too. They often snuck around the castle. Tristan turned when the guy he was pretty sure was called 'Bear' asked a question. "I thought I caught a glimpse of something but, they can disappear at will so it's hard to say. We need to try to lure them with affection. According to the students they love to be cuddled. Just don't let any of your skin touch them." Hence the gloves! Tristan had a thought and sat down on the floor with how back facing the wall, and put the cage behind him to conceal it from view. "Fluffsies, don't you want some cuddles? We just want to give you cuddles, that's all." He looked around hopeful. Eliora knew instantly when the groups split that she should have stayed with James. Or decided to stay in the Great Hall and check another hundred times if there had been anything she would need from in there. You know... the missing tables and whatnot. However, she was following those in the upper school and was already a step ahead of one of the Professors. Her gloves were on and the cage she had was disillusioned so as not to draw attention to it if when they ran into these little pesky pink handcuff accessories. "Splitting up isn't an option. Groups of two are more at risk than a bigger group. Safety is paramount." And if this group dared to split, she'd be having words with Hotmaster in his office later. Her employees were here to sort this issue safely, not by trying to get it done as quickly as possible and potentially lose someone along the way. "Two people very quickly becomes one." Her group appeared to be doing a bang-up job of checking every hiding spot if any of the pink critters were up there, they were going to find them. Kassie shrugged at the suggestion splitting up wouldn't be safe. She wasn't worried one bit. The whole Dolly incident was unfortunate but highly unlikely to happen again...right? The little fluffies were far too cute to be dangerous in her eyes. Plus, if Tristan wasn't overly worried, she wasn't going to be. She trusted him far more than she trusted the Ministry workers. Taking note of Tristan's method, Kassie went to the far corner and plopped down on the ground, placing her cage out of view and called out to the mutants. "Here, here little ones. Kassie just wants to snuggle you. Don't be afraid." The little group of pink fluffies hurried down the corridor and away from the humans carrying cages. They wanted snuggles and they could not snuggle trapped inside of a cage. Hearing the clanks of the cages heading towards them urged the fluffies on down the corridor and towards the towers. Maybe some of the little humans that liked to cuddle would be in the towers to save them? Indigo was coming out of his common room, planning on heading toward the library to do some studying. He'd walked between the library and his common room so many times and never run into any troubles, so he had no reason to think this time would be different. It was just a normal, average day. Except, this time when he headed out of Ravenclaw tower he saw something headed in that direction. It was one of those... things. The things that had eaten Dopple. Oh. Oh no. What was he supposed to do? His hand reached automatically for his wand, in case he would need to defend himself. Though the thing didn't look very dangerous. He should definitely tell someone that he had seen it. But who? By the time he got to the nearest professor's office the thing would probably be gone. Except... there was someone in the corridor ahead. A few someone's, actually. But he recognized at least a few professors, including Professor Wayland. He was Care of Magical Creatures so surely he would know how to handle this, right? "Professor!" He called, moving further down the hallway and further away from that little pink thing. "It's one of those creatures. Right over here, heading toward the tower." Bear bumped his head on the underside of the bench he'd been crouching under as he rose. "Ow," he complained quietly, rubbing the newly-formed knot on top of his head. Stood up too quickly. Still frowning, he took a quick second to Disillusion the cage he was holding, following Eliora's lead. He was already wearing gloves, but the thought of growing inordinate amounts of hair caused him to pull at them a little tighter. No thank you to that. He was thankful for Eliora's level head under pressure. Of course they shouldn't split up -- that was an awful idea. The creatures had somehow managed to almost... weaponize cuteness. And, you know, they ate people sometimes. That wasn't an ideal outcome, and it was much easier to avoid falling in love with the adorable things and then getting swallowed whole things going awry in a big group than it was with just a couple people. Bear's thoughts were interrupted by a student shouting -- at Professor Wayland, not him, the kid didn't even know him, but also was it just him, or were teenagers getting smaller and smaller over time? -- about a creature heading toward the towers. "Ah. Off we go then, I suppose?" Assuming the others would follow, he began the familiar trek toward the tower he used to call home, trying not to get too far away from the group for the reasons mentioned before. Mostly the whole not-wanting-to-be-eaten thing. No biggie. He walked cautiously, not wanting to frighten any creatures that may be tucked away nearby. Names? Ennis wasn't one to keep track of those. Not unless they formed a decent impression on him or if they were his superior. That being stated, the professor who mentioned gloves and the blonde ministry lady who said splitting up was not an option were perhaps worthy of names. His gloves were retrieved from his back pocket and slipped on just after setting the cage to levitate, disillusion, and follow just a ways behind him. But this.. cuddle business. This was not at all listed in requirements to catch them, was it? Couldn't they be stunned and put into the cages just as easily? Surely that would be a better option. There wouldn't be a chance for them to devour someone or spread their little disease around that way. Unless their fur prevented stunning? Strange. Ennis' eyes shot up as a student called to the group. Not his boy. Good. But someone around his age perhaps. "We shouldn't rush off. Not until we're certain this area is clear." On the same timeline as the group above if you want her. Chloe had been given some great advice and the advice she was going to take. She had worked days on figuring out what to put on a poster and had a little help with them. Now that they were done she was eager to get them up. Leaving her common room she headed down the corridor, before getting too far she noticed some people around looking for something. "Everything alright?" Her eyes moved around the area, maybe the cute little pink things were around? As she waited for them to respond she turned to the wall and used a sticking charm to put the poster up. "Keep up the search, everyone. We need to get all of them rounded up as soon as possible." Then she heard someone announce they caught sight of one. "Good job, Mr. Rousseau. Take a cage and follow it. Be sure to wear gloves and try not to touch it." She was pleased by the sighting of the mutant and hoped they would soon find more. Kassie heard the ministry worker. "Are you okay over there? Did you hurt yourself?" She briefly panicked that a mutant was trying to eat someone again, but quickly realized the gentleman (Bear) was rubbing the top of his head. "That will leave a nice lump." She was still sitting with her back to the wall when Ennis announce they shouldn't leave the area without making sure their current area was clear. He was correct, but they also needed to check the towers. "Maybe half of us can stay here and the other half head to the towers? Professor Wayland? Would you feel comfortable staying here with half the group while I take the rest to the towers?" Enter Ms. McCarthy. Kassie wondered what in Merlin's beard the young lady was doing. "Ms. McCarthy. Now might not be the best time to be placing posters around the castle. We have to find the mutants and get them caged as soon as possible." She shook her head and wondered where the girl had been to not know what they are doing. "Please, either return to your common room or help us capture the pink fluffy creatures." Last edited by Birchwoodmom; 03-15-2019 at 05:01 AM. The group of mutants had been hiding under the benches and behind the statues until a few of the humans began to sit and call to them (Wayland and Sutton). They looked like they wanted to cuddle and the pink fluffies loved to cuddle. There were also shorter humans roaming about (Chloe, Indigo) The shorter humans around the castle had been loving on them all year. Slowly they creeped out from their hiding places in hopes of some much needed snuggles, their only hesitation being the unfamiliar glove wearers (Bear, Ennis, and Eliora). Oh, yes the little things had been around if the adults were there looking too. She nodded to the professor, "Have they been spotted, I know they had been hard to find." She was in her common room and it was clear, so ducking out to the corridor right outside seemed safe. Though she still couldn't believe something so cute was harming anyone. "I'll head back to the common room ma'am." Before she could though she noticed something out of the corner of her eye. A little smile crossed her lips as she saw the cute little creatures and gave a small wiggle of her fingers to them. Glancing back at the adults she was glad O'Hara wasn't anywhere around, but she didn't want to scare the creatures either. In a very calm sing-song voice she tried to tell the adults without scaring the cretaures, "Over here"
Tristan continued to sit on the floor and call to the creatures. He was pretty sure it was the only way they would possibly get them to come out of hiding and of course Kassie was the only one listening to him at the moment. When Eliora spoke up about splitting up, he replied, “I agree. We shouldn’t split up unless it is completely necessary and we have more than two adults in each group.” The students that were starting to arrive to help…he wasn’t sure if he wanted to risk their safety at all. And then there was Indigo yelling about a creature being close by which probably meant it was now long gone. He sighed as Bear went off with him and continued to call to the creatures. He really didn’t like the idea of students helping to capture the creatures but…they were old enough to help. “I agree, Ennis, but it doesn’t look like we can stop them.” He said as Bear and Indigo disappeared up the stairs. 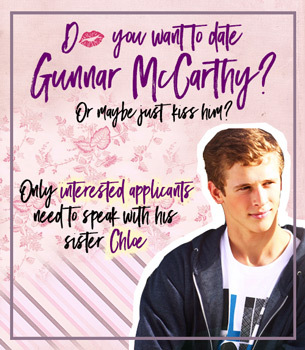 Suddenly Chloe was in the hall…and putting date requests posters up about her brother. Tristan facepalmed. Did this kid not know that she was supposed to be safely in her dorm? Apparently not. But Kassie handled it before he could say anything. With a nod and a small smile, Tristan replied, “I still don’t think we should separate but, yes, I’ll stay here.” Then out of the corner of his eye he saw something pink. He turned his head slowly, trying really hard not to sigh at Chloe. Saying anything could distract the creatures and make them run. “Come little Fluffsies. We just want to cuddle with you. Don’t you want some cuddles?” Tristan asked sweetly, his arms opened wide for the creatures to come into. It was a good thing he had long sleeves and dragon hide gloves on. Last edited by Suziella; 03-16-2019 at 03:59 AM. Just as Chloe started to walk off, she heard the young lady call out. Kassie's eyes darted to Tristan then back to where she saw some movement. Forgetting the idea of heading towards the towers, she slowly crouched down, keeping the cage well out of sight behind her, and held her hands out towards the little fluffies. "Tummy scratches over here. Come on, little ones, don't be afraid." Without looking at Chloe again, she softly spoke to her, "Call them over but don't touch them without gloves on. I'll be over in just a moment to help." She watched both the professors as they came over and started calling to the mutants. Chloe wasn't sure whether or not to keep calling or walk away, but the creatures were just so cute, so she stayed and tried to convince them to come out. "You are so cute, cuddles over here." Reaching both her arms out so they could see she wanted a hug from them or a cuddle. She hoped this could help and looked over towards the professor when she said about gloves. "Do you have any I could use?" If one got close enough she didn't want to do anything at all she was going to grab it so that the professors could take care of it. Kassie smiled at Chloe and gently slid a pair of gloves her way. She did it as quietly as possible as to not frighten the little pink fluff balls that were starting to poke out from their hiding places. “Put them on, but don’t make any sudden moves. Nice and easy. No need to scare off our little friends. Once you have the gloves on,” she continued in a sing-song voice “Start backing towards either me or Professor Wayland. We have cag-...transportation containers for the mutants.” She wasn’t sure how much the little fluff balls understood and didn’t want to risk saying cage.